A Jasper man found siting inside another person’s vehicle was placed under arrest early Tuesday evening on a number of charges including attempted theft of an automobile. Around a quarter after 6 last night Jasper Police received a call from a man who told police he located and detained a male subject sitting inside his vehicle after he left work. 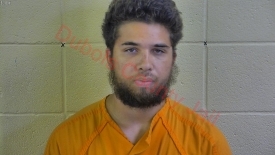 Police say when they arrived at the scene, the 3100 block of Lottes Drive, the suspect- 22-year old Jerod Tyrone Williams of Jasper told police he was directed by a higher power to borrow the victim’s vehicle. During an investigation police officers located Williams vehicle still running and parked snuggly against the business at that location. Upon approaching Williams vehicle officers say they could smell the odor of marijuana and were able to see drug paraphernalia in plain view. While taking inventory of the vehicle before being towed, officers also located the marijuana inside the car. Williams was placed under arrest. He was taken to and booked into the Dubois County Security Center on charges of attempted auto theft, unauthorized entry of motor vehicle, possession of marijuana and possession of paraphernalia. Be the first to comment on "MAN ARRESTED- SAYS HIGHER POWER TOLD HIM TO “BORROW” VEHICLE"